Bethine Hagemeister, age 83, of Aurora, passed away Thursday, March 9, 2017, at Hamilton Manor in Aurora. Funeral Services will be held 10:30 A.M., Monday, March 13th at the Aurora United Methodist Church. Rev. Mary Scott will officiate. Interment will be held at the Aurora Cemetery. Visitation will be from 5 - 7 P.M. Sunday at Higby-McQuiston Mortuary. Memorials may be to the family to be designated at a later date. Condolences may be e-mailed to the family through the mortuary website at www.higbymortuary.com. 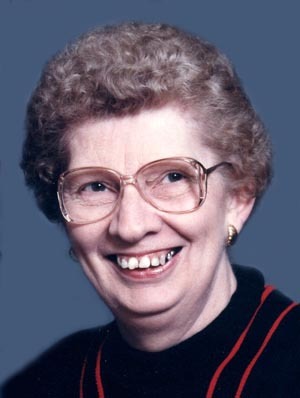 Bethine Wilma Hagemeister, the daughter of Frans John and Elva (Zimmerman) Anderson, was born in Litchfield, Nebraska on December 20, 1933 and passed away in Aurora, Nebraska on March 9, 2017, at the age of 83. She grew up in Litchfield and Loup City and graduated from Loup City High School in 1951. Following her graduation she worked at the telephone company in Aurora as a telephone operator. On December 26, 1954 she was united in marriage to Glen Hagemeister at Aurora, Nebraska. They lived in Aurora where she was a secretary at the schools for 8 years and for 10 years she was employed at the Hamilton Manor where she worked in the kitchen. Glen passed away on December 22, 1994 just prior to their 40th wedding anniversary. Bethine was a member of the Aurora United Methodist Church. She also belonged to an extension club. She enjoyed playing cards at the Senior Center and cooking for her family. Those left to cherish her memory are her sons, Ardean Glen Hagemeister of Tucson, Arizona and Alan Lee (Ramona) Hagemeister of Phoenix, Arizona; daughter, Jennifer Lynn Luther of Aurora; 3 grandsons, Matthew Luther, Nicholas Luther and Andrew Timmons and other family members and friends.